My parents have been married for 40 years. (Wow, right?) To celebrate, my mother decided she would like to research and plan a trip to Barbados for my family and some of our extended family. The villa we stayed in was amazing, recently renovated with marble, travertine, light colors and open sea breezes. We were not directly on the ocean but we had a lovely private pool and we could see the ocean on the horizon. My favorite part of the villa (besides having someone to clean, do laundry and cook for us - are you kidding ??) was the garden surrounding the home that contained amazing tropical flowers and palms. Almost every morning I would grab of cuppa and take a walk around the grounds to see if I could identify orchids, hibiscus and frangipani. The Plantation House villa is recently open to rentals by the public and our housekeeper told us that Rihanna stayed there in December (!). The decorating style is uber luxury but comfortable and we all loved lounging on the back terrace. 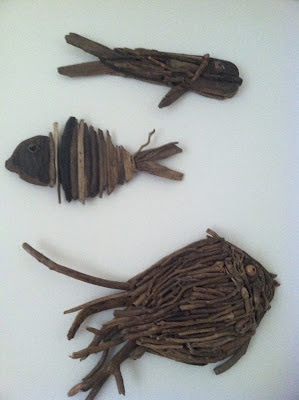 The designers also added some whimsical pieces such as fish and seahorses created from drift wood. 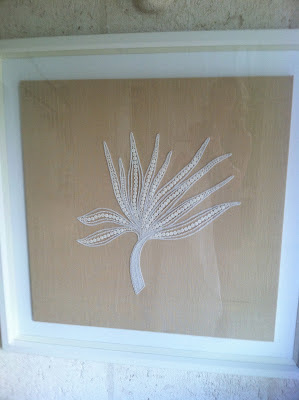 I'd also like to someday copy the use of buttons, beads and cording to make artistic forms of palm leaves and coral. Enough pics for now but I must share some of the green monkeys we'd see every day in another post... Okay, how about a picture of the view from the top terrace? We really had a lovely time.